Cristiano Ronaldo has netted his 100th penalty goal in all competitions against Valencia on Saturday. The Real Madrid superstar was fouled by Martin Montoya in the area in the 16th minute, and he stepped up to convert from 12 yards, bringing up a century for both club and country in all competitions. Ronaldo then added his 101st spot-kick goal, smashing the ball into the bottom left corner, as Montoya again committed a foul in the box, this time felling Karim Benzema. 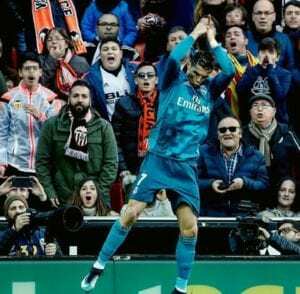 Ronaldo has struggled to find his shooting boots this season, and had netted just six La Liga goals prior to the encounter with Valencia at Mestalla.